Sampling New VIMS faculty member Juliette Smith samples an algal bloom in the waters of the Nauset Marsh Estuary System near Eastham, Massachusetts. Photo by Derrick Zarra. Seining New VIMS faculty member Juliette Smith conducts research in Lake Neatahwanta, NY to quantify food-web transfer of microcystins. Smith's work spans fresh, brackish, and saltwater ecosystems. Photo by Christopher Hotaling. Dr. Juliette Smith’s research focuses on one of the most complex and pressing issues in aquatic science—and she wouldn’t HAB it any other way. HABs—harmful algal blooms—are dense swarms of single-celled organisms that flourish in our planet’s increasingly warm and nutrient-rich waters. They cause at least $50 million in economic losses each year in the U.S. alone, due to shellfish closures, death of wild and farmed fish, human illness, and impacts to tourism. Smith, a new faculty member at the Virginia Institute of Marine Science, reports that a single bloom in 2005 cost the Massachusetts shellfish industry $50M. 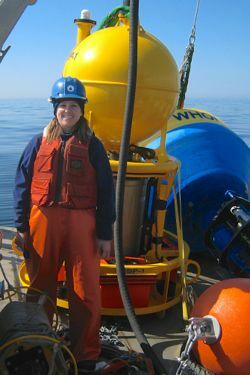 She’s particularly familiar with that event as it provided a backdrop for some of her post-doctoral studies at the Woods Hole Oceanographic Institution. Smith arrived at VIMS from WHOI early in 2014. Studying algal blooms—or “red tides”—is challenging enough. What makes Smith’s work even more challenging is that she focuses not only on the diverse array of organisms capable of bloom formation, but on the equally complex array of toxins they can generate. One particularly exciting research direction—still in the “proof-of-concept” stage—is a technique in which Smith measures the slight disparity in mass between different isotopes of nitrogen within a particular algal toxin. “Nitrogen in human and animal wastes is isotopically heavier than in natural sources,” explains Smith, “so I should be able to use isotopic signatures to track the source of the nitrogen that’s driving a bloom’s growth and toxin production.” By linking a bloom to its nitrogen source, managers could more effectively target nutrient-reduction efforts in a watershed. Another novel aspect of Smith’s research is her interest in studying the interactions among HABs and their toxins across different aquatic environments—from freshwater lakes and streams, to brackish estuaries like Chesapeake Bay, and into the coastal ocean. The toxicity of algal byproducts varies widely. 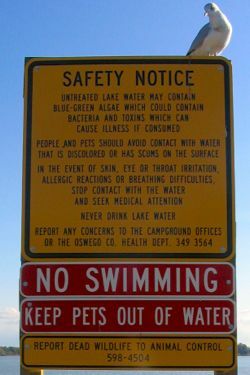 In humans, exposure to algal toxins via drinking water, seafood, salt spray, and other vectors can induce symptoms ranging from minor skin irritations to intestinal sickness, respiratory failure, and even death. The level of toxicity depends on a toxin’s chemical composition, which itself can vary widely. “Algal toxins come in many different forms,” says Smith. “Microcystins, a class of toxins that damage the liver, have more than 80 different “congeners”—chemical variants with slightly different molecular structures and masses. How does Smith deal with all these forms of complexity—from the level of molecules to ecosystems? “This is where I bring in some of my fun tools,” she says. 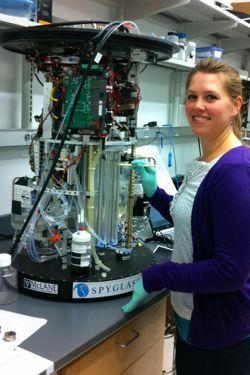 “Algal toxins vary in their physical and chemical properties, so I use a variety of tools—whether it’s a mass spec or analytical chromatography—to help quantify and identify them.” Mass spectrometers separate molecules based on differences in weight, while chromatography coupled with other detectors helps identify compounds based on how they absorb or emit light. Smith sometimes even resorts to ESP, a robotic “Environmental Sample Processor” that uses DNA probes, antibody tests, and high-resolution images to quantify toxins in the field, in near real-time. She also uses a high-tech sensor called an “imaging flow cytobot,” a laser-based instrument that can count thousands of algal cells per second as they pass single-file down a microscopic tube. That goal accords closely with HAB work already underway at VIMS. Professor Kim Reece, who chairs the Department of Aquatic Health Sciences that Smith now calls home, says “We’re delighted to welcome Juliette to our faculty. Her research integrates extremely well into ongoing projects that involve the emergence of new HABs in lower Chesapeake Bay.” Reece and fellow VIMS Professor Wolf Vogelbein—both members of Virginia’s HAB Task Force—have been studying this topic for several years. Also active in HAB research at VIMS are professors Steve Kaattari and Mike Unger, who are working to develop and refine biosensors for detecting and tracking toxins and contaminants in local waters.